Irish jump jockey Andrew McNamara ended his riding career with a victory in his final race. The 32-year-old, who is to become a trainer, won on 5-1 chance Most Honourable, trained by Shark Hanlon, at Tramore. "I had a brilliant time, I absolutely loved it," said the jockey. He won the Queen Mother Champion Chase at the 2006 Cheltenham Festival on Newmill and the 2008 Irish Champion Hurdle with Sizing Europe. McNamara is the brother of Robbie and the cousin of JT, who were both seriously injured in falls. The 6ft jockey said his retirement was due to being "plagued" by back trouble, not the injuries to his relatives. McNamara said: "Between my height and keeping my weight right, I am now moving on to what I always wanted to do - training." 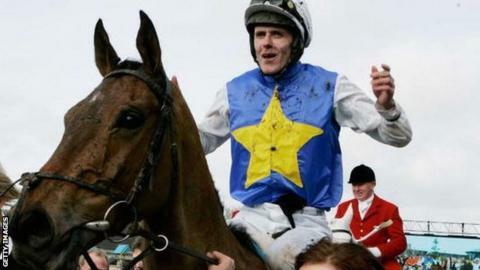 His other big-race victories among 15 Grade One wins included the 2007 Irish Hennessy Gold Cup on Beef Or Salmon and the 2010 Irish Grand National aboard Bluesea Cracker.